What&#8217;s the Score With Hiring Gamification? What’s the Score With Hiring Gamification? Gamification of hiring has certainly arrived, but it has not yet realized a lot of real-world deployments, and this is backed up by research from TJInsite which shows that despite the initial excitement generated by the appearance of gamification a few years back, just 25% of companies are currently using gamification in hiring. There is plenty of curiosity about gamification in hiring, as 66% of employers are considering using the process in the near future. Waiting for the killer gamification product? So, why the hesitation around gamification? While there is general excitement about applying game mechanics to hiring to select the best candidates, gamification is still quite conceptual and employers are struggling to see how game mechanics can be practically applied in their own businesses. Is it a case of ‘Not in My Back Yard? This idea is backed up by further findings of the Tjinsites study which found that 39% of surveyed employers believe that gamification’s lack of universal organisational appeal is a drawback of this concept. Maybe the ‘killer’ gamification product that really puts this idea center stage has yet to arrive. There is not a simple off the shelf product that you can just buy that will introduce effective game mechanics to your hiring process; it needs to be engineered and crafted, taking time, creativity and expertise that may not be in abundance. What skills is gamification being used to assess? But, on the upside gamification is still being used by 25% of companies, says the study, so what are they actually using it for? It seems that two of the key attributes that gamification is used to screen for are: ‘competitive drive’ and ‘multi-tasking’ abilities. Another interesting use of gamification, which is creeping in through the back door in my opinion, is not the gamification of the selection process but the gamification of the hiring process via crowdsourced recruitment. For example, we are seeing the increasing importance of employee and network referrals as a means of finding top talent. Businesses are in fact turning their employees and networks into talent scouts. This process is of course incentivized by financial rewards but there is potential for this process to be gamified by introducing the idea of hiring contests, league tables for best talent scout, divisions for top tier talent scouts and badges. Thus gamification can be used strategically to create a sense of rivalry in the process of crowdsourcing for talent for your business. This is of course not an entirely new concept as the idea of a contest to create rivalry, competition and motivation has been around for decades, particularly in the sales arena. Its just that a new spin can now be placed on it with the concept being applied to the process of crowdsourcing in recruitment. Despite the lack of a consensus on the practical application of gamification, I think there is a clear way forwards as evidenced by the approach of Quixley, which I think does have universal application. Quixey had to compete with the likes of Facebook, Google and Apple for talent and they have decided to deploy gamification to help them get ahead. They had the willing crowds, who come to their site, complete a minimum of three complex puzzles (thought to be a good indicator of programming ability) and following which they can apply for an open role at Quixley. This was just the start for them. They expanded the game and now users of the Quixley crowdsource system can submit questions to the system and offer a reward for someone to solve it or to refer someone who can. Names of winners and runners up are shown on-line and the leaderboard can be viewed by anyone. This is a great way for a company to find top talent in the engineering sphere and to then be able to cherry pick the best from the gaming leaderboard. But, can this approach be applied outside of engineering? I think it can. Upstream successfully applied their own gamification approach to hire five marketing managers and it is also successfully being applied in the hospitality sphere by Marriott. 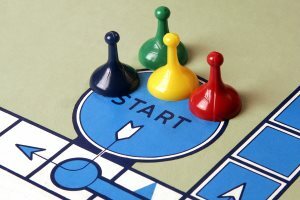 But, I don’t think it’s about waiting for the killer gamification product to hit the shelves – as I don’t think there is one – I think it’s simply about understanding the concepts of game mechanics and applying them to your hiring structure in a way that engages top talent and encourages them to compete in your game.